Hugo Tate (Blank Slate Books) was cartoonist Nick Abadzis' first major project as a young cartoonist. 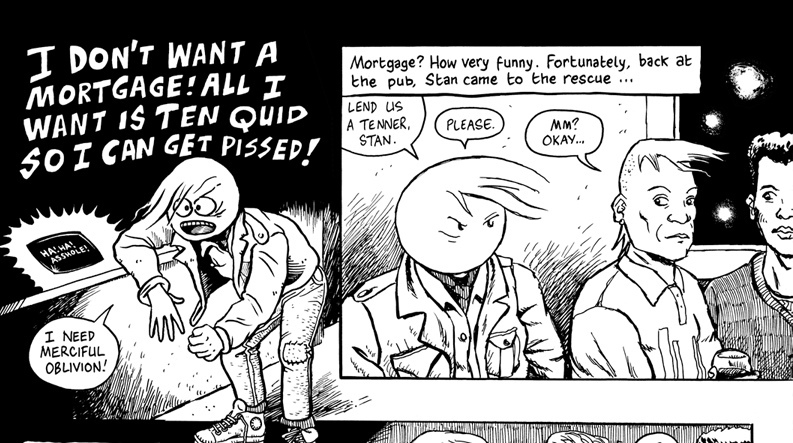 Working for the classic old British comic magazine Deadline, Abadzis did strips about the titular young everyman character that started almost as a lark but soon developed into something deeper and darker. After never being fully collected, the whole thing is finally back in print, and it's a gut-punch of a book in some surprising ways. As a whole, it's very much a work by a young man. That's both in terms of the skill level of Abadzis at that age (he was literally learning on the job), the ways in which he tried to compensate for his shortcomings as a draftsman, and the concerns of Hugo. As the book opens in London, Hugo is drifting and aimless. He has designs on being a writer but has no discipline to do so regularly. He wants to be successful but doesn't quite know how to work hard. His life revolves around his friends and the local pub, but as the first part of the book proceeds, he becomes more and more frustrated with the rut his life has fallen into, even at so young an age. Abadzis perfectly captures that twentysomething feeling of listlessness and frustration, where one isn't even entirely sure what they're frustrated about. He also moves from drawing stick figures to a dense, scribbly style that shows off his newfound hatching and cross-hatching skills. That's true for all the figures but Hugo, who is depicted with the same sort of blank, stick-figure face. It's a clever statement on the character's self-image that is refined as Abadzis sees fit. 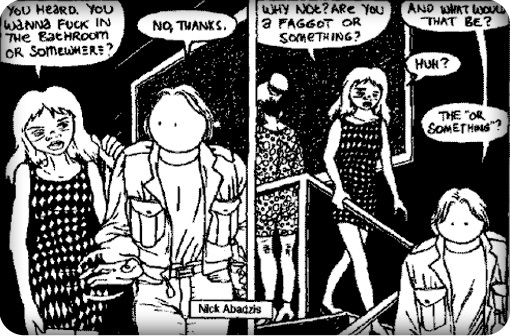 Abadzis' early work reminds me a lot of Evan Dorkin's: furious, swirling, intense, comedic and scribbly. The first part of the book takes some twists and turns and at times is a lovely and sad reflection on family, loss and connection. Like any young person out of school, the nature of connections and friendships is tenuous and confusing. Without a structure to keep everyone in the same place and doing roughly the same things, friendships drift and break apart. Family is no longer quite the same as people move and spread out. It's as much this feeling of total disconnection from everyone (a feeling that's more than a little self-absorbed, considering the number of people who care for him and the woman he leaves behind, not knowing she's pregnant) as it is his frustration with his general lot in life that spurs him to leave England. For someone young, the opportunity to explore America and leave one's past entirely behind is too good an opportunity to be true, even if the New York of the early 90s was still slightly seedy. Indeed, that seediness provided a sort of authenticity, a kind of validation of America as frontier territory. 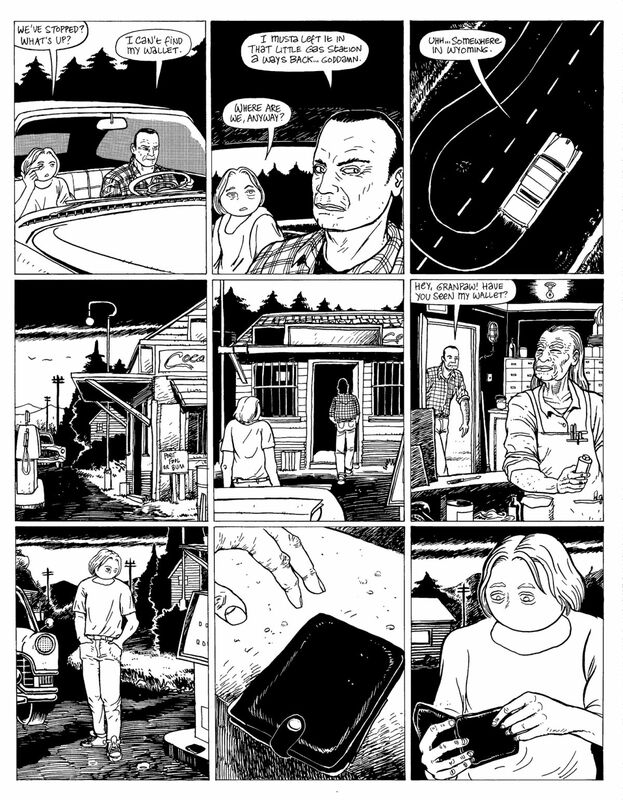 The second half of the book, "O, America" starts off as a lighthearted New York adventure and evolves into a Hunter Thompsonesque "Fear and Loathing" road trip that gets darker and darker as it goes further and further west. Hugo hooks up with a guy named Spoonhead for a job driving a vintage car across the country and quickly learns that his boss is a lunatic. Yet Hugo stays on, despite having the option of bailing whenever he wants and taking a bus back to New York. It's a dark night of the soul experience for Hugo, one where his mode of expression is literally thrown out the window as Spoonhead throws his notebook out of the car. It's a clever move, as Hugo's grounding narrative structure is suddenly gone, plunging both Hugo and the reader into total chaos. Abadzis goes nuts exploring fractured narratives, unreliable narrators, parts of the story left completely untold and a total breakdown and inability of his characters to tell the difference between paranoia and reality. 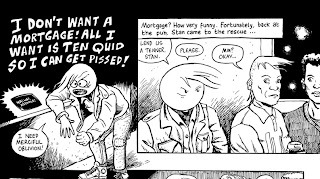 Spoonhead goes from being a slightly unbalanced rascal to violent and unstable thug to out-and-out evil lunatic by the end of the story, and Abadzis depicts that kind of madness and drug consumption as something toxic and communicable. Hugo goes through his own breakdown, finally finding some measure of peace after escaping the clutches of Spoonhead at a ridiculously decadent LA party and exploring the west coast on his own. Interestingly, that's where he left the character for good, as he never returned to Hugo to finish what would have been a trilogy of stories. It's understandable as to why--Abadzis is simply too far away from the artist who wrote stirringly about the possibilities and pitfalls of his own youth through fictional familial structures and nightmare scenarios regarding a country he's always had close ties to. 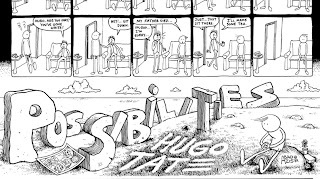 What gives Hugo Tate its power is that serialized sense of immediacy, that sense of a distopic youth fantasy being told by a young person. Retelling that story from Abadzis' perspective now would lack a certain authenticity, I think, even (as Abadzis suggests), he might tell the story backwards from the present. Better to leave Hugo sitting on that beach, forever changed and scarred by his experiences but finally ready to fully engage the world instead of making excuses for his frustration. 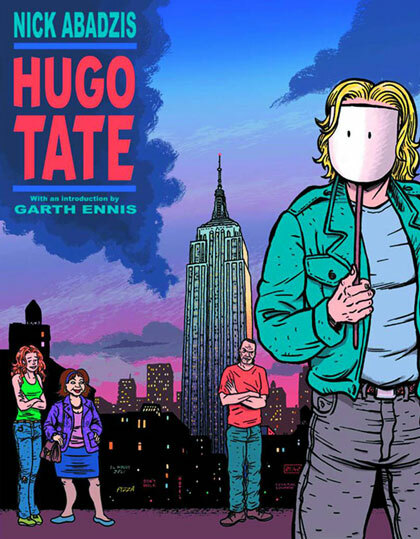 Hugo Tate in its essence is a dramatic coming-of-age story, and such narratives rarely call for "where are they now?" sections. This work stands fully on its own as a journal of the artist's own development as well as his character's.